Do you need extra help for EL students? Try the Answering "Why" QuestionsPre-lesson. Students will be able to answer 5W + H questions about fictional texts. Draw a blank concept web on the board with the word QuestionsIn the centre. Ask students to brainstorm the type of questions we ask each other or that we are asked in class. Clarify that you are looking for the first word of the question, or the question starter. Record the question stems in the outer circles of the concept web (who, what, when, where, why, how). Read the learning objective and have students repeat it aloud. Explain that today’s lesson will be a review of some of the most basic, but important, comprehension questions that we are asked as readers. These serve as a foundation for being able to answer the deeper, more challenging questions about a text. Beginning:Pair students with a supportive peer or an EL that speaks that same home language (L1), if possible. Intermediate:Have students brainstorm with a partner before sharing with the whole group. Point out the six pieces of chart paper around the room that are labeled with 5W + H questions about the story. Explain to the class that they will listen to a read aloud of a picture book and answer the 5W + H questions. Model answering one question by writing it on a sticky note and placing it on the piece of chart paper. Beginning:Allow learners to use bilingual reference materials to look up the question words. Pre-teach challenging vocabulary from the read aloud texts. Provide written and visual student-friendly definitions. Intermediate:Include visuals on the pre-made anchor chart. Ask students to summarize or rephrase the information that is gained when each type of question is asked. Facilitate a class discussion about the answers to each of the questions. Have students specify where in the text they learned the answer. Invite them to the document camera to point out the location in the book. Beginning:Have students work in a small, teacher-led group. Read aloud the questions for them, and provide sentence frames and a word bank for them to use as they answer questions. Intermediate:Put students with supportive peers as they work in a small group. 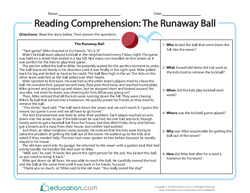 Distribute a copy of the Reading Comprehension: The Runaway Ball worksheet and have students read and complete it independently. Beginning:Read aloud the text to students in a small, teacher-led group. Provide a bank of words and phrases for students to use as they answer the comprehension questions. Intermediate:Allow students to use reference materials in their L1 or English to look up any unfamiliar words from the text. Provide a simplified text and question set for struggling learners. Have students read aloud the story on the independent practise worksheet. Allow students to utilize different colour writing utensils to colour code the questions and answers on the independent practise worksheet. Give students a more advanced text with chapters. Ask them to answer the 5W + H questions in complete sentences and use evidence-based terms (e.g., “According to the text…) as they cite text evidence to support their answers. 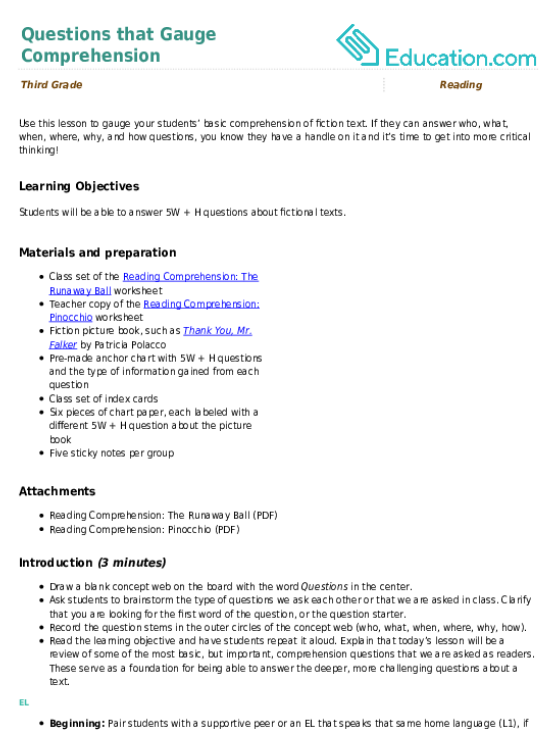 Allow students to use an online dictionary, such as wordsmyth.com or learnersdictionary.com to look up any unfamiliar words in the texts. Give students an opportunity to listen to an audio version of a story as they answer 5W + H questions about the story. 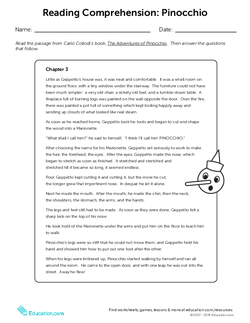 Put a copy of the Reading Comprehension: Pinnochio worksheet on the document camera and give each student an index card. Read aloud the text. Display the following questions and instruct students to choose one question to answer. What did Gepetto name his puppet? When did Gepetto start making Pinocchio? Where did Pinocchio go when he got to the open door? Why did Gepetto keep cutting Pinocchio’s nose? How did Pinocchio learn to walk? Beginning:Reduce the number of questions students are required to answer. Allow students to answer the questions orally in a small, teacher-led group. Intermediate:Give each student a copy of the text on which to make notes as they find information to support their answers. Go over the answers to each of the 5W + H questions, and ask individuals to share the text evidence they found to support the answer. Record student answers by marking evidence on the displayed copy of the text. Poll the rest of the class to gauge whether they agree or disagree with the student’s answer. Allow for class discussion if necessary. Beginning:Have students share their answers and text evidence with a partner. Allow them to point to the text evidence in the text. Use this lesson to gauge your students’ basic comprehension of fiction text.